In 1830 in a Normandy village called Villedieu-les-Poles, Mr. Ernest Mauviel established the Mauviel manufacturing company. Villedieu-les-Poles, long known as The City of Copper, has an 800-year heritage of copper manufacturing. Mauviel's manufacturing expertise is based on this rich tradition of copper manufacturing that has been handed down from generation to generation. Since the very early-years, Mauviel has been a fixture in the professional and commercial markets. Today, Mauviel continues to offer the professional chef products that are unsurpassed in quality and design. 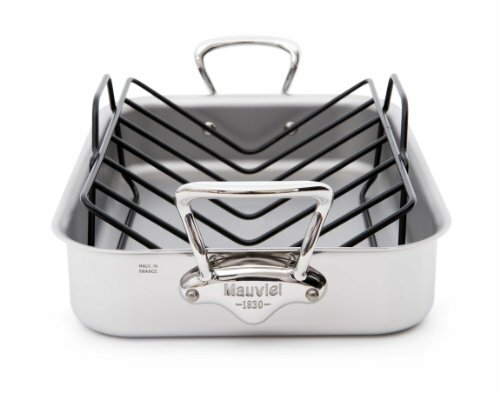 Throughout the world, Mauviel is the cookware acclaimed chefs depend on: their restaurant and reputation relies on the best. Mauviel offers several collections of superior cookware- each designed and crafted to meet the needs of the most discerning chefs. Mauviel's M'Cook Collection is a high performance cookware line comprised of the following five layers: Magnetic Stainless Steel interior, Aluminum, Aluminum Alloy, Aluminum, and a Magnetic Stainless Steel exterior. Each piece in the collection is uniformly 2.6mm thick, and is designed to work on all cooking surfaces: electric, gas, halogen and induction. The handles are made of stay cool cast stainless steel and are ergonomically designed for safe usage. The M'Cook collection has pouring rims on all the shapes; is oven safe (to 680-degree F) and dishwasher safe. Made in France, Lifetime warranty. MADE IN FRANCE SINCE 1830. Mauviel is the leading cookware manufacturer for professional and household chefs throughout the world. HIGH PERFORMANCE 2.6 mm thickness; 5 Ply Construction. M'Cook offers superior heat conductivity and controlled even heat distribution. HANDLES STAY COOL. Cast stainless steel handles stay cool during use. Pouring rims on every shape. Dishwasher Safe. CAN BE USED ON ALL COOKING SURFACES. Gas, electric, induction, halogen stovetops, and in the oven. Oven safe including under the broiler. GUARANTEE. All Mauviel products are guaranteed for life against any manufacturing defects for household use.